Holy Trinity Online Giving Now Available! Giving to Holy Trinity Church in support of its many ministries and services is now easier than ever with online giving! Many of us pay our bills online - we even automate those payments to ensure our bills are not paid late! It's also possible to automate your church giving. Our secure system allows you to conveniently make donations online. You can choose to make a one-time contribution or establish a recurring weekly or monthly contribution. Best of all, you don't need to remember to write a check or bring your offering to church - it's already taken care of! Visit www.HolyTrinityPgh.org/give or click the image below to sign up and donate! Yes. In many ways giving online is safer than writing a check because an electronic gift cannot be lost or stolen. The security of the system is continually managed by Vanco Services. Vanco utilizes the highest Interent security practices and provides secure and confidential transactions for over 23,000 organizations including various business, nonprofit organizations, and other parishes. Q: What types of funding sources can I use? You can give online from your checking account or savings account or via debit or credit card transaction. We ask that if you use a card that you consider giving an additional 2.75% to help us cover the card transaction fees. 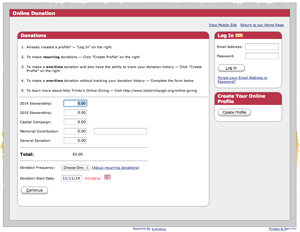 There is an option to automatically calculate and include this include this when setting up your donation. Not to you. You will not pay any fees with an online gift. In addition, online gifts are a more cost-efficient way for the church to process donations. Q: Do I need to create a user account? You do not need to create a user account to donate one-time contributions. However, creating an account allows you view your complete contribution history and set up an automatic donation plan. You can also change your donation plan frequency, amount or payment method at any time. For recurring gifts, you have the option of giving weekly, or monthly. Q: What happens if I forget my login id or password? When you create your account, you determine your own log n ID and password. If you forget them, the system can email them to you. You can also change your password at any time. We will never call you to ask for your login information. Gifts can be given to Stewardship, Capital Campaign, as a Memorial Contribution (please specify for whom the contribution is in memory of) or as a general donation. We recommend the latest versions of Internet Explorer or Mozilla Firefox, but most any browser will work.